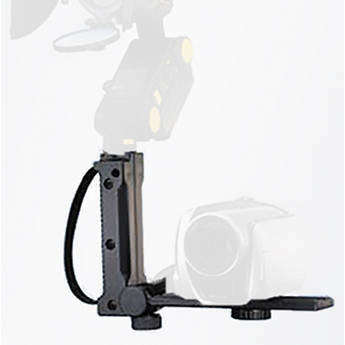 The Dedolight Rail with 1/4" Screw and Handgrip for DLOBML is a device designed to mount the Ledzilla DLOBML (DedoLight On Board Mini LED) to a video camera. The DLOBML is a tiny-but-powerful on-camera LED light, and this rail with a handgrip makes it possible to mount the light offset to the side of the camera, rather than directly on top of it, avoiding flat, straight-on light often associated with camera-mounted lights. The handgrip makes the camera and light much easier to hold and control. Box Dimensions (LxWxH) 6.6 x 2.1 x 1.2"